Bristol Bay’s westside district posts a million sockeye catch Monday, and both the Wood and Nushagak Rivers have met their escapement goals. The red run is off the charts, but the kings are lagging big time. "Steveo" Maher, co-captain of the F/V Toonces, was not happy to be in the harbor for repairs Monday. The rest of the fleet was posting one of its biggest catch days ever, tallying more than a million sockeye landed. 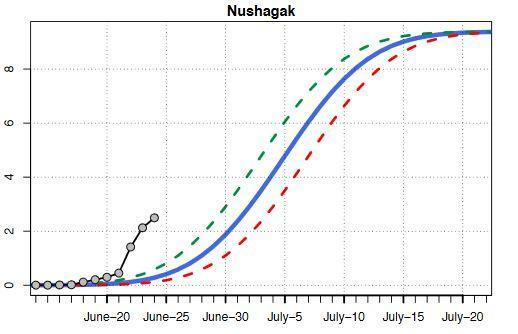 KDLG: “The Nushagak River escapement is off the charts,” state management biologist Tim Sands said on June 22, after the Nushagak had tallied close to 300,000 sockeye in its first week of counting. That same day technicians at Portage Creek would add another 295,000, and the following day just over 200,000 more, as the river leapt several days ahead of its curve. Sands put the set and drift net fleets in the water on June 21 and fished both gear groups steady through the weekend. On Sunday June 25, the fleet caught more than 400,000 sockeye, and Monday’s tally was an incredible 1,050,000. “Since I’ve been here, the single day harvest has never exceed a million fish,” Sands said Tuesday morning after the counts came in. The blue line represents "on time", and the green two days early, the red two days late, if the run is coming in as forecast. What to make of the Nushagak's catch and escapement in 2017, graphed in black? The total forecast to the Nushagak River is 1.9 million fish, part of a district total forecast of 8.6 million (including the Wood and Igushik Rivers). Monday’s catch and escapement pushed the district nearly halfway to its total forecast, and the escapement goal has been met for the Wood and exceeded for the Nushagak. The question on the minds of many is whether this run is way early or way big. Sands thinks it might prove both. “I think the answer for that, clearly for the Nushagak River, is already yes. Because we’ve already accounted for more than 1.9 million on the Nushagak,” said he said. Word from the grounds Saturday and Sunday was that fishing was exceptional for those who didn’t anchor up during a short lull in the action, or miss fishing after grounding out on the minus three foot low water tides. The Nushagak Chinook salmon run has been one of the more reliable in the state for several years, but is off to a depressed start. Through Monday, only 21,000 kings had been counted past the Portage Creek sonar, way behind the “curve” to get to the in-river goal of 95,000. The sport fish division added some restrictions on the catch, and Sands held off commercial fishing a little longer than he had to in order to give the kings a chance to get going. It is possible the Nushagak king run will be a bust this year, but another commonly held theory is that the kings have held off for better conditions. “The water’s low upriver, that could have had them just milling out in the Bay, waiting,” Sands said on June 22. Some fishermen upriver reported the water was so low, their subsistence nets were full of green algae and no one was catching kings yet on rod and reel. “I’m disappointed that the king run has not appeared the way it normally does or should have, and I’m even more disappointed that our biologists feel we have used all of their tools to protect the kings,” Alaska Sportsman’s Lodge king camp manager Jeff Pfaender wrote in an email. Pfaedner said he will seek a regulatory change to require the commercial fishermen to step down their effort by half, similar to the first step of sport fishing restrictions, when the king run is lagging. “By having commercial [fishermen] leave one tide each day, we should get more kings into the river,” he said. It is also possible that more kings are getting past the sonar than are being counted, as the equipment has a difficult time counting fish that run in the center channel of the river. On low water years, kings may hold to the middle of the river more than usual. Sands said ADF&G believes that has happened once before. Through Monday, the commercial fleet had landed 16,053 kings in the Nushagak District, about half of what they might catch through an average season. Elsewhere, fishing is off to a more normal start. The Egegik fleet has harvested 1.4 million sockeye through Monday, Ugashik 138,000, Naknek-Kvichak 37,000, and the smallest and latest district, Togiak, has landed about 10,000. The total run, counting escapement, is six million sockeye out a preseason forecast of 41.5 million.